Also, the software will work for older versions of Windows and Starter edition if .NET Framework 3.5 (or later) is installed. Photo to Cartoon can be downloaded from here. Click on the Download button. Depending on your browser, there will be an option to Save/Download or/and to Run/Open the file as shown below. 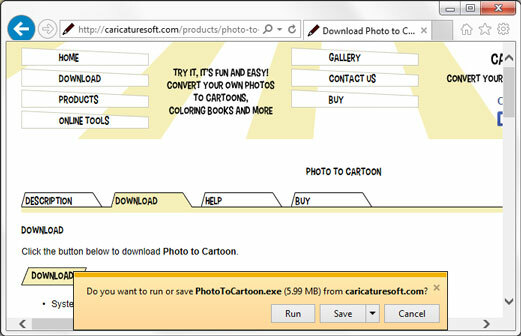 For Windows 7 and Windows 10, in order to use Photo to Cartoon software, Microsoft .NET framework 3.5 has to be enabled on your computer. It is enabled by default, so it is rare for it to be turned off. 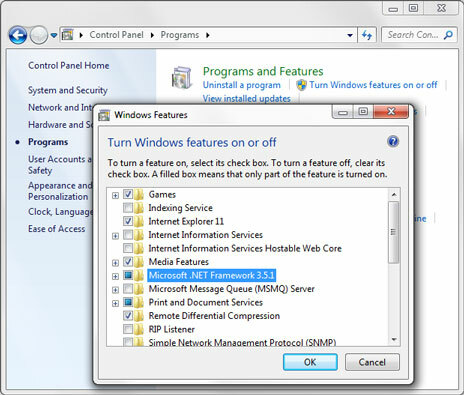 If it is turned off, it can be switched on in Control Panel->Programs->Programs and Features->Turn Windows Features On or Off, as in the picture below.